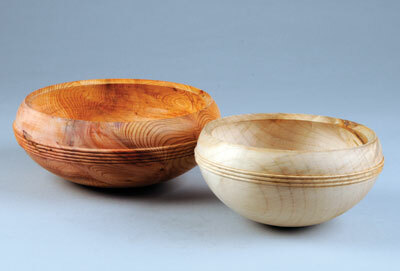 Turned bowls are not only strong visual items, but they are also extremely tactile. Whether in large or small varieties, they can be used for a variety of useful household purposes, such as for holding fruit or salad, etc. As well as being incredibly useful, they also form an intrinsic part of our lives and most people have at least one, or sometimes two or more in the house in some shape or other. The timber and shapes we choose will directly impact the visual appearance as well as what we choose to use the item for, for example, as a vessel for fruit, etc, or simply as an empty vessel with purely aesthetic value. I like picking up bowls but often find that the 'foot' can get in the way. 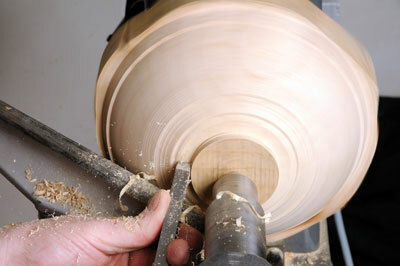 With this thought in mind, I decided to include one of my favourite bowl shapes which uses a round bottom instead. 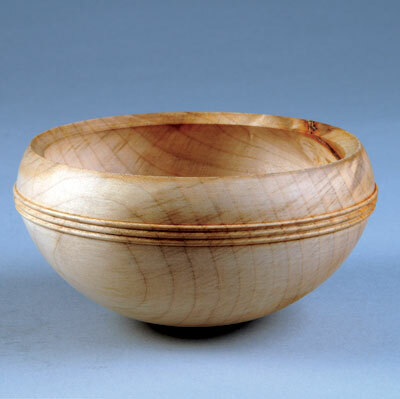 The bowl is made from sycamore (Acer pseudoplatanus) and the blank should measure 76mm (3in) high x 250mm (10in) in diameter. The nature of the shape allows you to work right through from start to finish, without the need for rough turning and due of the nature of the form, it will disguise any movement that might occur. 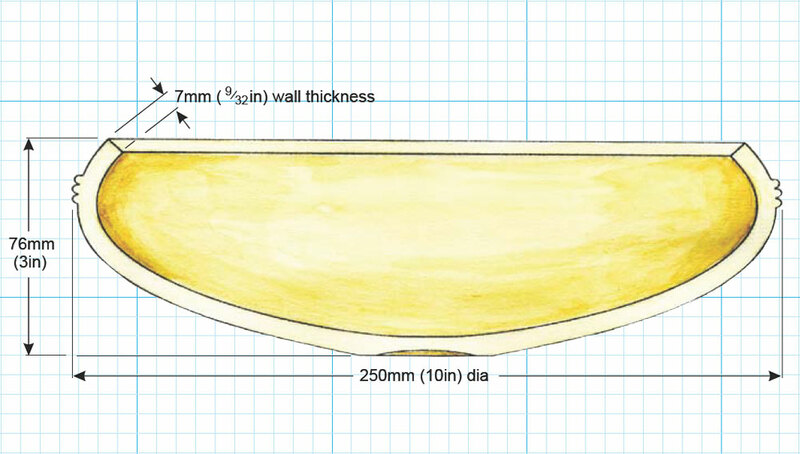 Since the bowl has a re-curve from the widest part (about two-thirds up from the bottom) it can be called a semi-enclosed form which is ideal for holding items and is visually, in my opinion far more pleasing than a bowl with a gentle outward sweep from the bottom to the rim. 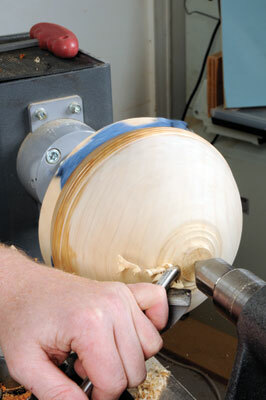 2 Mount the blank on a screw chuck or faceplate and work from the bottom area of the bowl towards the rim and create the shape for the bottom 2/3 of the bowl. The tailstock can be brought up to provide extra security should you choose to use this. 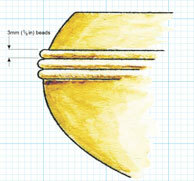 (Note that the cut is occurring on the lower edge of the wing with the flute pointing in the direction of the cut). Keep making light cuts until you are happy with the overall form. 3 The bowl requires holding in place while you hollow out the inside, so ensure to create a chucking area for the method you will use. 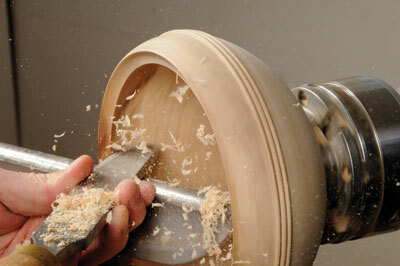 In this case, a spigot or a scroll chuck, and then continue to refine the shape of the bottom section of the bowl. If you are not using the tailstock centre for security, mark the centre of the spigot so that it can be centralised later when the bowl is reversed to remove the spigot. 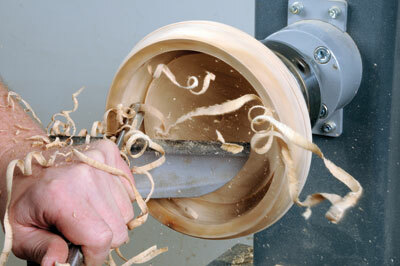 4 Remember this bowl has a re-curve so you will need to create the inward sweep. Since the grain direction is running in the opposite direction, you will need to work from the rim down towards the widest part of the bowl. 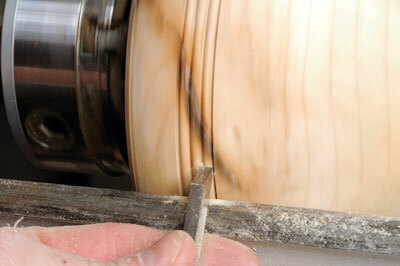 Again, the flute points in the direction of travel and the cut occurs on the lower wing of the gouge. 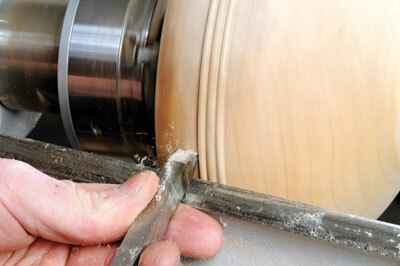 5 If the shaping process reveals a fault in the timber, as mine did, you will need to make a decision as to whether to fill it, either with a cyanoacrylate or by using coloured fillers (I used a cyanoacrylate). If you do not wish to use this method, or if the flaw or fault is too big to warrant working with, discard the blank and start afresh. I personally like to experiment with flaws when they occur and more often than not I like the end result. 6 After shaping, and in my case once the glue is dry, use a gouge, scraper or sand the shape with coarse abrasive until you are happy and have clean flowing curves. 8 ...use a beading and parting tool for the area near the beads and make a light cut, forming the shoulders of the start and finish of the beads. 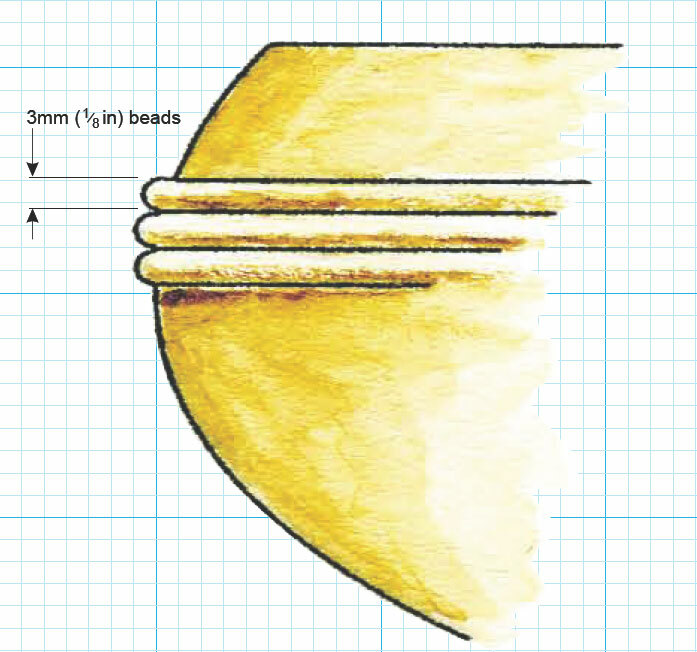 (Note that for this form to work effectively you need to ensure the bottom curve is visually continued on the reverse side of the beads). Assume the beads are not there and visualise the one continuous flowing form with no interruptions. 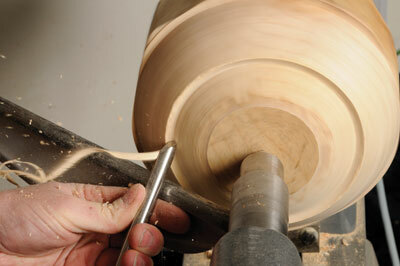 10 ...use a scraper to refine the shape further, taking extra care in the top section. This will help you blend the curves together. Once happy, sand the inside of the bowl, rim, top exterior part of the bowl and the beads down to 400 grit and apply a finish of your choice. Oil was used in this case. 11 The bottom section still has a spigot - to remove this, use the between centre friction chucking method. It is cheap and effective and requires a disc of wood or a part-turned bowl held in a chuck or on a faceplate, over which is placed some non-slip router mat of cloth/tissue paper. The bowl is placed over the part-turned bowl or against the disc, the tailstock is brought up to support the bowl on the previous marked centre point, and pressure applied to ensure it is pressure cramped to the part-turned bowl or disc of wood. 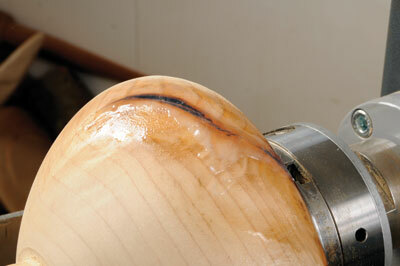 The tissue paper prevents friction burns should the wood slip. 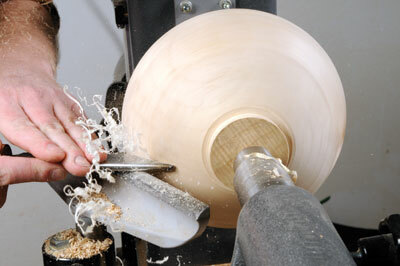 Use a bowl gouge to remove most of the spigot - be mindful to create a nice curve to the base - but leave enough of the spigot to support the bowl while you sand the remaining un-sanded section of the bowl down to 400 grit. 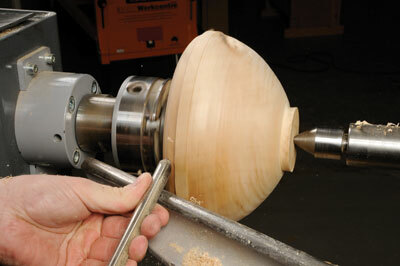 Once happy with the finish and curvature, remove the bowl and carve off the remaining spigot and blend into the curved base by power or hand sanding to a final finish. If you require a base cut a loose ring for it to sit on. "Remember, this bowl has a re-curve"